The folks at Feedjit have put together four great widgets designed to show of your blog's traffic and guide readers to your most popular content, live! 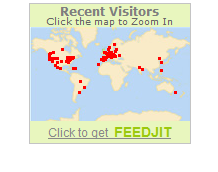 Feedjit's widgets are customizable to your blog's look and feel and don't require any registration. Friday, November 30, from 10 pm PST to midnight (that's 05:00 to 07:00 UTC on December 1) we'll be performing routine maintenance on TypePad. During this time, access to the TypePad application, TypePad blogs and the TypeKey authentication service may be impacted. From nominations for the 2007 Weblog awards like Amalah, who won for the Best Parenting Blog, to coverage in publications around the world, it’s been another great week for TypePad customers! Canadian publication, The Godrich Signal Star, profiled TypePad blog Smiling Eyes. The blog enables photographers to provide their services free of charge to those battling cancer. Smiling Eyes began in November of 2006, when founder Christine Kufske provided a neighbor with a complimentary photo session prior to her chemotherapy. Love is in the air for blogger Emily Anderson of EcoChic Weddings, who was recently interviewed on The Today Show. Emily and her husband were featured in a segment about how to make love last. Very appropriate for a writer who penned EcoChic Weddings, a book about how to have a sustainable wedding. Todd Barrett Lieman’s book, “GoTo Guides for Guys ABCs for Expectant Dads" was covered by the San Francisco Chronicle. Todd also blogs about his experiences as a father to 2-year-old Kolby on Life and Times of a New Dad. Thanks for all of those who wrote in with suggestions and tips about their blogs in the news. We’ll be keeping an eye out for other customers in the news for the next post! Have you ever wanted to make your blog's sidebars wide enough to contain large ads and oversize widgets? These themes were made with you in mind! We've created versions of the Asterisk themes we added earlier this month with sidebars large enough to hold items up to 300px wide – perfect for the wider ad units from services like Google Ad Sense. Want to use a wide sidebar, but keep your current theme? If your account level is Pro or higher you can set the width of your sidebars using custom CSS. You can apply the Asterisk Wide themes to your blog by visiting the Design tab under your blog. Enjoy! Have feedback for us? Seeing any bugs that need fixing? Let us know in the comments. While we offer a variety of themes and layouts, subscribers at the Pro, Premium or Business Class level can also use CSS to change the look and feel of their weblog without Advanced templates. TypePad designs are created with CSS flexibility in mind, so you can make big changes with just a few code edits. The Custom CSS option can be used to make minor changes, such as styling a blockquote or highlighting Technorati tags. 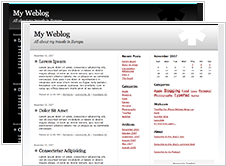 You can use CSS to have control over the column widths for your weblog. Whether you using a pre-defined or a Custom theme, we have detailed instructions on changing your column widths with CSS as well as information on adding background images to your weblog or even to each specific column. You can also use Custom CSS to add a customized banner to a pre-defined theme or remove the default banner padding that is automatically included. If you're using an Advanced Template set, you can even use CSS to set up a mobile or print-friendly version of your weblog following the instructions found here. We are always working to add new tips and tricks to our Knowledge Base, so be sure to watch that article for different things that you can do to jazz up your weblog. As Facebook announced yesterday, we are excited to offer Facebook Beacon functionality on TypePad. Facebook Beacon is a new feature on Facebook makes it simple to insert actions into your Facebook Mini-Feed and News Feed from sites outside of Facebook, and then in turn share them with your friends on Facebook. Offering Facebook Beacon on TypePad means that you can now choose to share your new blog posts with your friends on Facebook. This is an opt-in feature -- you'll be able to control whether or not you want to send your posts to Facebook, and of course we'll only do this when you're creating posts on the blogs you publicize. We see this as a great way to help you let your friends on Facebook know that you've updated your blog. You can read the TypePad Knowledge Base article for more information about how to enable Facebook Beacon for your blog. This month, we’re touring TypePad in Chicago, where professors at the University of Chicago Law School, a green building advocate, some music lovers, and a mortgage planning specialist are just some of the Windy City’s bloggers. Lofty legal issues are discussed and debated by the faculty at the University of Chicago Law School on their TypePad blog. Plenty of lively discussion, thinking, and research take place on a wide variety of legal topics, from whether the current Supreme Court session will usher in a paradigm shift, to whether liberals should start being originalists. Chicago is a city known for its architecture, and green buildings are the subjects of GreenBean, a TypePad blog written by Erik Olsen, Green Projects Administrator for the Chicago Department of Construction and Permits and manager of the Green Permit Program. Olsen posts drawings and photos of environmentally-friendly projects that are unbuilt, in-progress, or complete as a resource for the Chicago design and development community. Speaking of building projects, don’t miss Dan Green's blog, The Mortgage Reports. Green is a Certified Mortgage Planning Specialist, and uses his blog to discuss the state of the economy and how it affects the mortgage and real estate market. Green dispenses advice to real estate buyers, is interviewed by other experts in the field and then posts the podcasts for all to hear. Chicago has plenty of music, and plenty of people who write about it, starting with music journalist Mark Geelhoed. His TypePad blog, Deceptively Simple, is full of news, reviews and commentary about happenings in the Chicago classical music scene. Geelhoed gives helpful recommendations in his sidebar, like Compact Discs Worth Your Dollars, and introduces Musicians With Blogs in another sidebar. This is a must-read for anyone interested in local classical music. Brian Dickie shares his enthusiasm for his role with the Chicago Opera in Brian Dickie, Life as General Director of Chicago Opera Theater. This is a blog that brims with Brian’s contagious love for all things opera. It contains beautiful photos and reports of his travels around the world scouting singers and judging opera competitions, and of local opera news and events. It’s a behind-the-scenes glimpse into a world most of us never see. Now let’s go subterranean to visit Radio Free Chicago, a TypePad blog that is "Chicago's Underground Music and Media Resource". Ten contributors post live reviews, previews, news, interviews, podcasts, downloads and more on this comprehensive compendium, making this a happening site for all music fans. We barely scratched the surface of TypePad users in Chicago, so we'll return again for another tour. Nationally syndicated Fox TV show, The Morning Show with Mike and Juliet, interviewed TypePad blogger, Katherine Stone, on Postpartum Depression. Katherine blogs about this (and on topics such as supplements for depression) at her Postpartum Progress blog. Sometimes, our customers are actually the media writing the article. Pam Peirce is a garden columnist at The San Francisco Chronicle. Last week, she covered how to control clover growth and use barn owls for rodent control. You can also read her blog at Golden Gate Garden. Thanks to all of you who sent us tips on news coverage of your favorite TypePad blog. Keep sending them in and watch for yours to appear here! Last week we added two new themes to TypePad. They're designed to look great on their own, and be customized easily using TypePad's CSS feature. Asterisk White is a fresh, clean white theme, and Asterisk Black has a dark sophisticated look. You can apply these themes to your blog by visiting the Design tab under your blog. Enjoy!